Jirák, Josef ; Linhart, J. ; Neděla, Vilém ; Černoch, P. ; Špinka, J. Scintillation Secondary Electron Detector in Environmental SEM. In Nebesářová, Jana; Hozák, Pavel (ed.). Proceedings of the 8th Multinational Congress on Microscopy. Prague : Czechoslovak Microscopy Society, 2007, s. 89-90. ISBN 978-80-239-9397-4. [Multinational Congress on Microscopy /8./, Prague, 17.06.2007-21.06.2007, CZ]. Maxa, J. ; Neděla, Vilém. Selection of PDM Information System. In Abstracts of Reviewed Papers of the 3rd International Conference Mechatronic Systems and Materials (MSM 2007). Kaunas : Kaunas University of Technology, 2007. S. 277. ISSN 1822-8283. Neděla, Vilém ; Weyda, František ; Černoch, P. Advantages of Study of Amber Fossils with lonization Detector in Variable Pressure SEM. Microscopy and Microanalysis. 2007, roč. 13, suppl. 3, s. 250-251. ISSN 1431-9276. Neděla, Vilém. 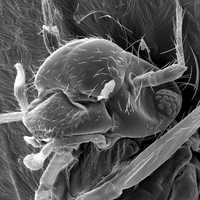 Dynamical in-situ observation of biological samples using variable pressure scanning electron microscope. In Abstract Book of the Electron Microscopy and Analysis Group Conference 2007. Bristol : IOP, 2007. S. 41-42. Neděla, Vilém. Methods for Additive Hydration Allowing Observation of Fully Hydrated State of Wet Samples in Environmental SEM. Microscopy Research Technique. 2007, roč. 70, č. 2, s. 95-100. ISSN 1059-910X. Neděla, Vilém ; Roubalíková, L. Study of Tooth Cement Using Variable Pressure SEM. In Nebesářová, Jana; Hozák, Pavel (ed.). Proceedings of the 8th Multinational Congress on Microscopy. Prague : Czechoslovak Microscopy Society, 2007, s. 293-294. ISBN 978-80-239-9397-4. [Multinational Congress on Microscopy /8./, Prague, 17.06.2007-21.06.2007, CZ]. Neděla, Vilém ; Roubalíková, L. ; Černoch, P. Study of Tooth Root Surface Treated with Various Techniques Using Variable Pressure SEM. Microscopy and Microanalysis. 2007, roč. 13, suppl. 3, s. 234-235. ISSN 1431-9276. Roubalíková, L. ; Neděla, Vilém ; Poleník, P. Adhesive Preparation – a Comparsion of Various Methods. In Laser Congress 2007 – 4th Congress of the International Society for Oral Laser Applications SOLA. Berlin : SOLA, 2007. S. 41. Roubalíková, L. ; Neděla, Vilém ; Vaněk, J. Adhezivní preparace s použitím Er,Cr: YSSG laseru. In Středoevropské sympozium IX. brněnské implatologické a dentální dny. Brno : Masaryk University Faculty of Medicine, 2007. S. 24-25. Roubalíková, L. ; Neděla, Vilém. Morphological Analysis of Root Canal Walls after the Er,Cr: YSGG Laser and Hand Preparation. In Abstract Book of the 13th Biennial Congress of the European Society of Endodontology. Istanbul : European Society of Endodontology, 2007. S. 19. Maxa, J. ; Neděla, V. Teorie zavedení simulovaného prostředí EPD a PDM do výuky. VUT FEKT Brno: 2007. s. 1-141. ISBN: ETE 07-016. Maxa, J. ; Neděla, Vilém. Selection of PDM Information System. Kaunas, Lithuania: Kauno technologijos universitetas, 2007. s. 277 (1 s.). Neděla, Vilém ; Weyda, F. Advantages of Study of Amber Fossils with Ionization Detector in Variable Pressure SEM, Digitální mikroskopie a analýza obrazu v metalografii, Plzeň, 2007.